AT FIRST YOU THINK YOU HEAR IT, but maybe it’s an auditory illusion, an aural mirage born of anticipation. Now though; for certain. There it is, the distance sounds of a marching band drumline. At first, standing along the parade route, you hear it and then you feel, then they come into view. It’s a powerful thing, at least to an aspiring young drummer who’s been banging on pots with wooden spoons since his first Christmas parade. Words can’t express, so I’ve included a video, if you’re so inclined, to one of the finest drumlines in the nation, the Cadets drumcorp. Notice the near perfect precision, the dynamics, the textures. This is the product of hours of individual and team practice and discipline. 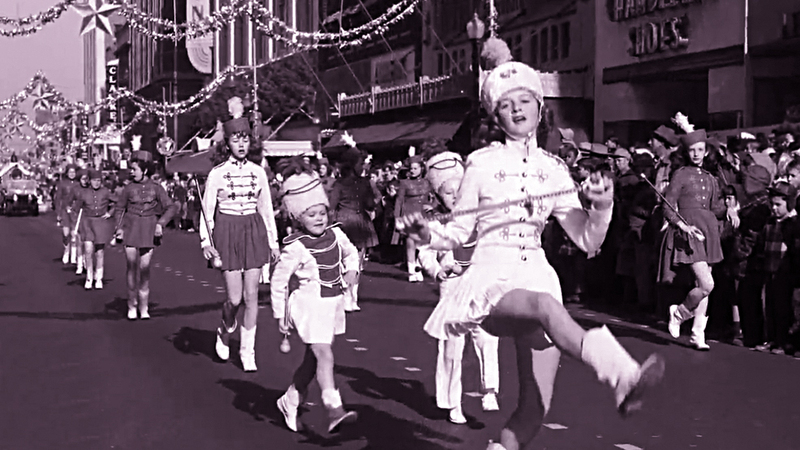 Among my favorite childhood memories is going with my family to downtown Tulsa for the Christmas parade, hearing the distance drum cadence of that first marching band as they approached. Not too many years later I got to be in a drumline in that wonderful parade and on marching fields and parade routes from Tulsa to Washington D.C. across Canada and Europe. And, to this day, half a century later, I still love to sit at a drum set and play. I am so grateful to my parents for making all that possible and for band directors, percussion teachers, mentors and role models for cultivating the seeds. I have two sons. I am happy to say that they are both fine drummers. Watching them learn to play and develop their own style was so fun. And, they are still playing today. Much has been written about the research done on the value of music and music education to a broader education application. Study after study confirms the impact on student grades, discipline and even school attendance. Let’s not forget the impact of music therapies of all kinds: physical, emotional, mental and certainly spiritual. I am saddened and concerned knowing that school music programs are being cut or eliminated because of dire financial straits in our educational system, but also by misguided motives and priorities and politics. I am also concerned that our churches, once a fertile ground for budding musicians to have an opportunity to grow and develop have structured worship music more like a concert, with young aspiring musicians relegated to the role of spectator. So, where are the seedbeds, opportunities, the classrooms, the labs, the practice rooms, the studios, the stages for the next generation of musicians? Maybe it will still happen in quiet, individual ways and on YouTube. Maybe for many they will never know the wonder of getting their first instrument for fifth grade band and discovering the richness of music. Scripture says that old men will dream dreams. Well, I’ve been dreaming. I’ve managed to gather some resources, not a lot, but some, and I want to use these resources to help the next little drummer girl or drummer boy get their start, by helping them get the instrument they need and maybe a few lessons to get them off to a good start. I’m not interested in just buying drums and sticks so some kid can drive his mother to insanity. The percussive arts aren’t for everyone, yet in a way they are. All music takes a lot of practice and commitment. Of course, not all will play like the Cadets Drumline, or Jack DeJohnette, or John Bonham, or Eric Harland, but they can, with practice and hard work, find joy and a sense of accomplishment, and make a difference. So, maybe you can help me find the next one. Do you know of someone, maybe in the 8 to 14 or so age range, who has shown musical interest, who would have some level of encouragement from home, but may not have the resources to get the equipment or expertise to get started? Maybe you’re someone who would want to join in and help a young drummer get a start. Maybe you have a snare drum, a decent drum set, or a few cymbals stacked up, gathering dust in a corner, that you would want to donate. Let me know. You can have a parade without horses or floats, or “Miss Whatever” perched on the back of a convertible. You don’t even have to have a Santa Claus at the tail end. But, there’s no way to have a parade without a drumline (and I mean that in a big, broad metaphorical sense). Put your fingers on the inside of your wrist. If you can’t feel the pulse of your internal rhythm section—your parade has passed. The cadence is that important. IN MY LAST POST I wrote a bit about a video project called “Recollect” where famous jazz musicians go to a record store, flip through the records there and tell rich stories of life and music. The thought occurred, “If I could choose some folks to go to the record store with, who would I choose and why?” Quickly, names bubbled to the surface of my grey matter. Actually those were not the first names that came to me. The people I thought of first are people I know personally. I know them to be mindful connoisseurs of music, curators of a wide library of music. These people have stretched my musical tastes and understanding, through them I experience music through fresh eyes and ears. These are people like my two sons Corey and Kyle. Then there are people who helped shape my own musical library years ago, like Jim Norris, Randy Miller and Roger Roden. Occasionally you need to “go to the record store” with younger people, those who can introduce you to new artists and music, people like Molly Hennesy and Mary Corley. Of course all of us have friends who just seem to know and appreciate music: deeply and with an open mind. For me, these are people like Gene Chapman, Zack Merrill, Amy Merrill, Steven McConnell, Bryan Horvath, Kevin Gosa and so many more. As I type these names I’m noticing other common traits: they all are musicians, they are all thoughtful people who place high value on the creative process. I would gladly spend a day in the record shop with any of them. If fact, I hope to talk with many of them to find out what they would dig for if we could go shopping together. There are two others that came to mind right away: Dan Haynes and Rob Carmack. I’ve known both of these guys for a long time now. We see each other from time to time, and if we are able to visit for more than five minutes, the conversation will often turn to music. Each of them has a broad music library and each of them can tell a great story. Right away Rob said: “Prince — Sign O The Times”. He’s been searching the record bins for that album but has yet to find it. Apparently, demand is high since Prince’s untimely death. The conversation turned to the albums they each valued most. For Rob, Rolling Stones — Exile On Main Street, Led Zepplelin II, and anything by Bruce Springsteen. Rob is a fan of the man and his music. In fact Rob hosts a podcast called: “Bruce Springsteen Sings The Alphabet”. While I like the original Led Zeppelin and Rob prefers II, we both agree on some of the newer artists worth adding to your library like: Lakestreet Dive and The Decemberists. My good friend Dan knows music: from the American rock songbook to the nuts and bolts of music. He is a highly respected sound engineer and runs sound for a variety of bands and artists. Dan taught me the value of a set of really good headphones. It is the only way to enjoy the nuance of what happened in the studio when the record was made. By the way, my preference for fine headphones: Grado. They are made in America and are amazing. You can get a set of entry level Grados for under $100. Trust me they are worth every penny. I wrote a post about them a few years back. I remember early one Saturday morning, years ago, someone knocked on our front door with a sense of urgency. It was Dan. In his hands were his headphones and a new album by The Police. As if the house was on fire he said, “You’ve got to listen to the snare drum on this song! !” It was “Roxanne”. It was impressive. I am a fan of Steely Dan and Dave Matthews because of Dan’s enthusiastic endorsements. As we visited, I was surprised by this: apparently they both have an admiration for Sir Elton John because of my insistance that he is one of the great songwriters of our time. We all agreed that Elton’s "Tumbleweed Connection" holds a special place in our musical libraries. The song “Madman Across the Water” is classic Elton John. Rob noted one other newer band worth listening to. They are a favorite of mine and my son Corey’s. It’s a band called “Dawes”. I leave you now with the apropos lyrics of one of their songs. But don’t just read the lyrics, buy the song and enjoy. I thought I wanted to be an athlete. Baseball would have been my first choice. I loved listening to the St. Louis Cardinals on the radio and going to watch their farm team, the Tulsa Oilers. Alas, it was not to be. I was tall enough but lacked any kind of mass, muscle or other. Maybe basketball could be my game!? Sorry, no. Turns out the Jenks elementary team only had ten uniforms and there were at least eleven guys with more talent or parents who could pressure the coach. Oh but fifth grade brings hope for everyone. That’s the year you can join the band. I have no doubt that right now there are excited, aspiring, budding musicians in schools all across the land choosing their instrument. For some, choosing the right instrument is a dilemma. Not for me. I knew that I would be a drummer. If you can have a calling at ten years old, I had one. By junior high, there’s a separation of sorts. Tough guys play football, the rest are in the band. But drummers get a bit of a pass (or at least that’s the way I worked it out in my own mind). I learned from my grade school band director that “drummers are a necessary evil”. He would have had a band full of clarinet and trumpet players if he could have figured out how to march in a parade without a drum cadence. The great thing about this healthy tension was that it gave us drummers a bit of a bad boy vibe (or at least that’s the way I worked it out in my own mind). Early in my drumming life, The Beatles brought their brand of rock and roll to America and my fate was sealed. I would soon be the next Ringo Starr. Now all I needed was a set of Ludwig drums (like Ringo’s) and a couple of guitar players and a bass player. I’ll never forget the day, my dad picked me up from school and took me home to find that first set of drums. I’m sure there were many times my parents thought, “What have we done?” I practiced and practiced and practiced some more. Finally, I found those band mates and before long we were playing at school dances and “Teen Towns”, and life was good. Here is a picture of the stage band at Jenks High School in 1968 or so. That’s me at my drum set I so dearly loved. Jenks High School Stage Band. 1968. In retrospect, I am glad I didn’t have the wherewithal to play sports. No doubt it would have been fun. To be able to say that I played football for the mighty Jenks Trojans, undoubtedly the most dominating high school football tradition in the state, as I sat around recovering from knee replacement surgery. But, I wouldn’t trade a state football championship for the experiences that being a percussionist have afforded—the opportunities, friendships and world travel all possible because of music. I wish I could look up some of those old band mates, directors, and teachers to reminisce a bit. Fast forward to the present. Both of our sons are drummers, and so for many years we have had a drum set in our house, even though I sold my drums years ago. Just recently our youngest son married a musician and moved out and took his drums with him. I have missed him and his drums. I had a thought: maybe I’ll put a little kit together, find some drums on eBay or Craigslist, keep my eye out for some used cymbals. So in a casual search of the double-u, double-u, double-u, I learned that Ludwig, just this year, came out with a brand new drum set that is a “vintage” replica of my first drum set, right down to an exact color match and lug design. Then as luck would have it, I found a demo set of these amazing drums at a drum shop in Portsmouth, New Hampshire. Now these beauties are set up in our home and I am having a great time living in the past from time to time. If there are any old guitar players out there who know how to play Wipe Out and House Of The Rising Sun and Louie, Louie, give me a call. Maybe we’ll be ready to play a few proms next spring.